Sony has released plans for updating some of its devices to Android 4.3 and Android 4.4 versions. Android 4.4 KitKat is the latest version of the Android and Sony will release the update to its 2013 flagship models. The list of devices that will get the update include Xperia Z, Xperia ZL, Xperia ZR, Xperia Tablet Z, Xperia SP, Xperia Z Ultra. Sony said the above said devices are in the first phase to receive updates that means Sony will update other Xperia devices to Android 4.4 KitKat where it is possible. Sony Support pages gives an indication of which devices will get the KitKat update. Xperia Blog reports that Xperia SP device support page shows Android 4.4 as the future version of the firmware, suggesting that it will get the update for sure. 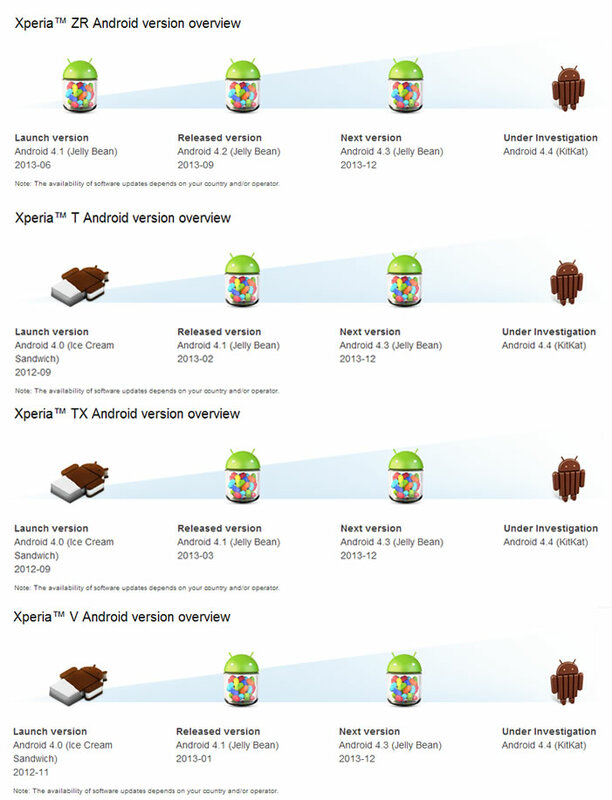 Other devices that might get the update include Xperia ZR, Xperia T, Xperia TX and Xperia V. These devices support pages show Android 4.4 KitKat update as under investigation suggesting Sony might be looking at the possibility of updating them but has not yet decided. If you own any of the above devices you might get the Android 4.4 KitKat in the future, but it is upto Sony to decide to roll out the update or not. I’m using xperia sp it really worthwhile. Sony mobile with durability.